Yes, it's true. 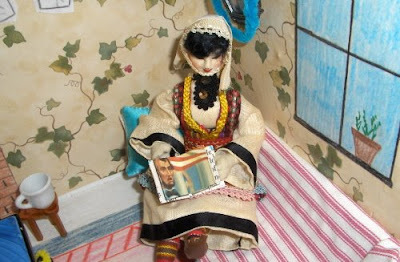 The mysterious foreign doll who showed up at the doll house needing a home wants to become an American. Even now, she is studying to become a citizen. Gasp! She's reading about... War? Oh, it's a particular war. 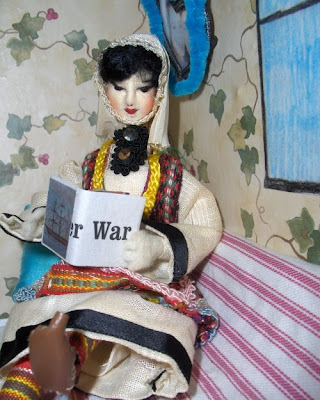 The beautiful doll shows us that she is learning about Abraham Lincoln from her little history book for dolls. By the way, we are still trying to learn her name. I have an idea for a name for her. My daughter has a few ideas. Do you have any suggestions for a beautiful name for the mysterious foreign doll? I would love your comments! Lynn, thanks for leading me to your blog. I have been thoroughly enjoying going back through it for the past hour. I love what you and your daughter have done with the bookcase house. It is beautiful. Mei(beautiful) Ling(delicate)~ Mei Ling. You have to admit she is both beautiful and delicate looking. Or Kiyoshi which means quiet, bright, shining, and clear. She is keeping quiet about her life and travels(that's what makes her mysterious), yet she is bright and shining where she is. Her travels haven't dulled her beauty. Isn't it fun picking out names?